Branded cards are a solid investment! Standard poker-size playing cards give you a true casino experience accompanied by your company’s custom imprint. The cards are made with two-ply plastic-coated card stock with a black centre. Proprietary centre is the same centre used in casinos and prevents onlookers from seeing through them. 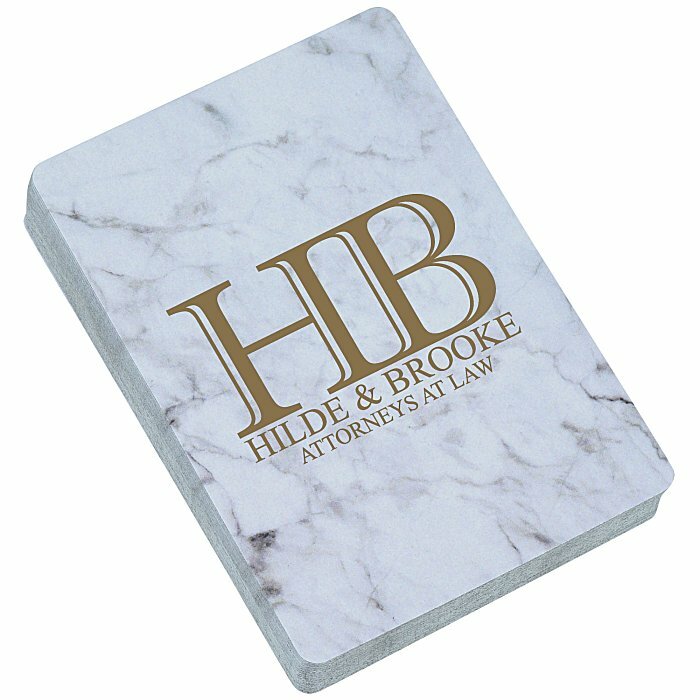 Back of each card features a marble design, perfect for high-status events! Great for home poker nights, company party entertainment, fundraisers and much more. Also makes a great customizable souvenir for popular tourist destinations. Each deck of cards is packaged in a standard tuck box with a see-through window. Size: 88 x 63mm (3-1/2" x 2-1/2"). Your price includes a one colour imprint on back of each card. * Excludes art preparation time, applies only to orders of 200 items or fewer.